If the time is right for you to welcome a new puppy into your home, Congratulations! Bringing a new puppy into your home can bring plenty of joy, but they are definitely a lot of work. Whether you are getting your first puppy or just need a refresher, here are some tips for you to help get you and your new family member on the right track. Before you bring your puppy home, ensure that your home is as safe as possible. Puppies are EXTREMELY energetic and curious so when puppy-proofing your home, be thorough. Puppy-proofing is similar to baby-proofing, in that you’re trying to keep the puppy safe and out of things that he shouldn’t be in. Things like household plants, electrical wires, medications, cleaners, children’s toys, trash cans, laundry bins, and food items should all be placed out of reach. You will also want to purchase some essential puppy supplies such as a leash and collar with ID tag, food and water bowls, a wisely chosen puppy food, appropriate toys, and a dog crate/ kennel. Now that you are ready to bring home your new family member, schedule an appointment to see the veterinarian for a comprehensive exam, update any vaccinations, and have a stool sample checked for intestinal parasites. This visit is a good time to ask any questions that you may have for the vet. It may be helpful to keep a list of questions leading up to your appointment. Important things to discuss would be vaccination schedule, heartworm and flea preventions, when to spay/ neuter, basic training and manners, and diet. Over the course of your puppy’s first six months, you will be in to visit us a lot. This begins with puppy vaccines and typically leads to spay or neuter. Just like human babies, puppies (and kittens) need basic immunizations to take over when maternal antibodies begin to fade. The puppy vaccinations series is one of the most important aspects of your puppy’s early life. Typically puppies should be spayed or neutered around six months of age. Also, at six months of age they should have their first heartworm test. 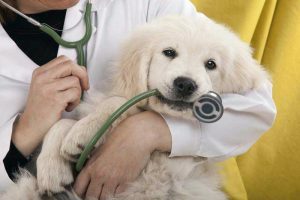 To help with the cost of the recommended needs for your puppy we offer Preventative Healthcare Plans and you should consider Pet Health Insurance. Although your puppy is cute and friendly now, he or she may mature to have their own opinions about his/her surroundings. Dogs are pack animals and will assume the highest position in the pack if allowed. Establish yourself as the “alpha dog” so your new puppy is not the one to set the rules in your home. Teach your puppy that it is okay for you to play with their feet, reach in their mouth, brush him/her, and touch their ears, feet, and tail. It is important for you to be able to medicate, examine, and groom your new pet. Teaching your puppy basic manners and training is the foundation for good behavior. Obedience classes help you learn how to train your puppy. Training classes are great for socialization with other dogs and dog owners. While training a puppy can be a challenge, the result will make your efforts worthwhile. A solid foundation of training provides structure and gives your dog confidence. House training is one of the first things you will teach your new puppy and should begin as soon as he/she comes home. Even though some puppies catch on earlier than others, this process can be quite challenging. Puppies under the age of 10 weeks have no control of their bladder or bowels. This means they should be taken out every hour that they are awake. (Luckily, puppies sleep a lot.) It helps to have each family member take a regular “shift” for house-training the puppy, so the responsibility doesn’t turn into a burden for one person. The puppy should be on a regular feeding schedule and take away his food between meals. Do not leave the water down, offer water multiple times throughout the day, and take your puppy out as soon as they are done drinking. Take puppy to the same spot each time to do his business and praise your puppy when they go. As a general rule, you should take your puppy to their designated “potty spot” immediately after eating or drinking. However, accidents happen, so be prepared, consistent, and patient. The bond that you have with your puppy begins the moment that they come into your life and it never stops growing. We look forward to building a relationship with your new family member and caring for all of their medical needs over the many years to come.